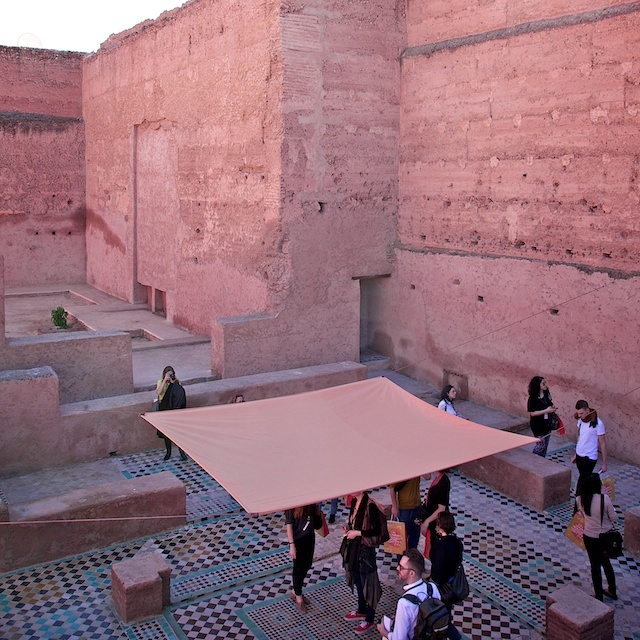 ‘Where Are We Now?’ – the 5th edition of Marrakech Biennale (26.2 – 31.3.2014) took off this week across historic Marrakech sites and abandoned buildings – brought back to life with art events and exhibitions. A launch party was attended by thousands of locals as well as international VIP guests. The venues range from the vast 16th century Palais Badii to the empty Theatre Royal opera house in the Gueliz area. At Palais Badii in the space occupied by the photography museum a film by Shezad Dawood is one of the highlights. At Dar Si Said contemporary works are merged within the museum, a beautiful old riad. Hicham Khalidi, who curated the visual arts exhibitions, shared some thoughts with us after the opening at the central venue Bank Al Maghrib by the Jamaa El Fna square. He is based in Rotterdam and came back to work in his native country to organise the largest curatorial programme he has taken up so far, which confirms the significance of Marrakech Biennale in the Maghreb. It also brings new life to ancient buildings, enriching those spaces and reviving abandoned ones with art shows and events – a great contemporary edge to the city. A longer interview with Hicham Khalidi and Vanessa Branson, the founder of the Biennale, in the next issue of Grand Tour. As well as contemporary art shows talks are hosted at riads and hotels around town on art, literature and film. Riad El Fenn in the Medina is one of the key sites for the talks with international cultural figures. Fringe events take place during the five weeks all around town.